U.S. Olympic hopeful Daron Rahlves, right, tries to rally in a January 2009 race. (CNN) -- Daron Rahlves has one more thing he wants to add to his resume: an Olympic medal. Rahlves is one of the most accomplished Alpine skiers in U.S. history, having won 12 Alpine World Cup races and a world title. But in three previous Winter Olympics he has never had a chance to step on the podium. He retired from Alpine skiing in 2006, after the Turin Games, but a new Olympic event means he has one more chance to finish in the top three. The event is ski cross, where multiple racers take to the course and battle each other through a downhill-like course with banked corners and jumps similar to a freestyle layout. With four skiers all trying to get the fastest lines, skis will touch and bodies will bump sometimes -- and the crashes can be spectacular. "It's a roller coaster on skis. Anybody who does it will love it," Rahlves said from northern California where he was taking a break between races to give his wife a day off from taking care of their children on her birthday. Ski cross is the only new event for the Vancouver Games, and while it seems like it made a pretty quick run into the Olympic program, it's actually been around for decades. But its popularity has only grown substantially in the past few years, especially thanks to competitions geared toward younger audiences like the X Games. It also helped that snowboard cross drew large audiences during the 2006 Olympics. Ski cross appeals to skiing and non-skiing fans. "It's the most pure, cool, racing event because it is head-to-head competition," said Fuzz Feddersen, a three-time Olympian in freestyle skiing. "It's like when you were a kid and you were at the top of the run and you are like, 'Let's race to the bottom.' "
In a race that takes a little more than a minute, the first seconds are almost always the most important. Racers of all kinds call it the "holeshot," the battle to be first to turn No. 1. 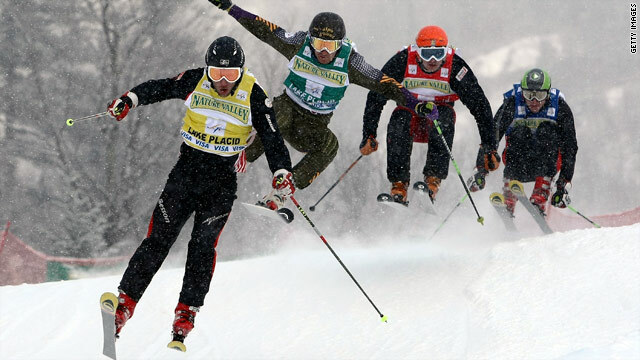 It's no different in ski cross, where a mass start becomes a test of technique and strength. Whoever gets the best start and leads at the first gate often controls the rest of the race. The rest of the field is reacting to you, said Brett Buckles, a former ski cross racer on the World Cup circuit and a ski cross coach. She said that someone who takes an early lead wins most of the time. "Unless something really [bad] happens, if you ski well, and if your skis are fast, it's pretty hard to lose," she said. In early heats, it can help if a teammate is in your race, Rahlves said. That comes into play when the leader can work with the second-place skier to stifle any passing attempts by the other racers. Skiers who are behind will often settle in and draft off their opponents, waiting to make a last-minute pass, Rahlves said. And try to do so without making contact. Casual contact is allowed in ski cross, but Buckles and Rahlves said racers do their best to avoid it. It slows a racer down in a sport where a half-second can mean making out of your heat or not. Rahlves said that racers who are side-by-side, however, will lean on each other to put some pressure on each other -- literally and figuratively. "Everybody is physical, everyone is trying to take advantage of any opportunity," he said. It's the aggressive nature of the sport, he said. It's what drew him back to skiing. He also wanted to be involved in growing the sport of skiing. "I'd like to showcase the sport in a new way," he said. "It's the new age of skiing. It's going to be great for the younger generation. There are a ton of kids who try to make the U.S. ski team and now there is another road to go down." While Rahlves will be one of the top medal contenders, the Canadian men, who train on the Olympic course, are the favorites. They have a talented pool of skiers led by Chris Del Bosco, a citizen of Canada and the U.S., but teams for the Olympics have yet to be announced. In the women's race, every racer will be watching six-time world champion Ophelie David of France. If she fails to win, it will be shocking, and will probably be to her teammate Meryll Boulangeat. There is always the intangible of the weather. Cypress Mountain in Whistler, British Columbia, is somewhat close to the ocean, so rain and fog may come into play. Rahlves said that if the course is a little sloppy that would make the start even more important. It would also take away lines outside the main path. Unlike many courses, the Olympics venue has a true ski cross layout, and Rahlves said it is a good, long course but not necessarily a fast one. He thinks that plays to his strengths and he should be strong enough to be in the final. "I want to go out there and put something up on the medal count for the USA," he said. "It'd be cool. It's the one medal I haven't been able to get yet. It'd still mean a lot."